On our visit, we cruised the main boulevards and avenues, seeing some of the very palatial mansions in which wealthy folks and embassies reside, as well as the parliament houses, the President’s digs, other government buildings, and some of the large urban parks. 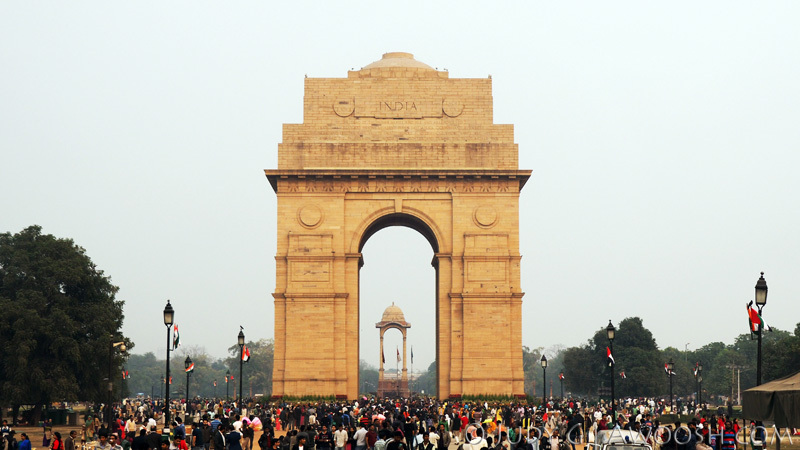 There are many universities and technical colleges in Delhi – some of the best in India we were told. Contrasting with these grand properties and hallowed halls of learning were the slums. There were places where we saw people (including women with babies) who are apparently living in ditches. The contrasts are extreme, and it was sad to see so many people in need, but this was the India that we had read about in awesome books by Mistry, Rushdie & Co., and so expected. It is is one of the most striking things about India – the stark contrasts: between conspicuous comfort and abject poverty; between extraordinary beauty and terrible ugliness; between a pristine jungle trek in Khajuraho and the piles of non-recyclable garbage littering the landscape, upon which cows, goats and dogs feast; between the breathy chanting in an ancient, dark, carved Hindu temple and the cacophony of noise in Varanasi, the city of Hindu pilgrimage; between religions purporting to promote peace, but which have many followers living in chronic tension. All of the locations we visited in India shared these strong contrasts, and seeing people living in shacks just outside the gates of palatial mansions, hotels, and modern universities, although jarring, is the norm. As a relatively well off westerner, it would be pretty heartless to not feel empathy, and at least a bit of guilt, for realizing that we have so much, in the obvious, in-your-face evidence that there are so many people who have so little. Although I have traveled in Asia, Mexico, Ecuador, and other locations where there are a lot of people living in poverty, the sheer magnitude of the number of people struggling to survive in India totally eclipsed everything I’d seen. I felt deep gratitude every day while I was in India for my great luck at being born where I was, for having lifelong access to education and health care, for a beautiful life living on the wet west coast of Canada, for having the ability to travel. Anyhoo – back on the tour, time to go. Bonnie, our awesome guide, had explained to us about Indian Stretchable Time – a concept where an appointed time is actually pretty elastic, and five minutes might actually be ten minutes, or twenty minutes, or half an hour later, or even an hour. But man, our trip ran like a Swiss watch. The bus left at the appointed hour. Like clockwork. The entire group figured out quickly that IST did not apply, and no one seriously straggled. 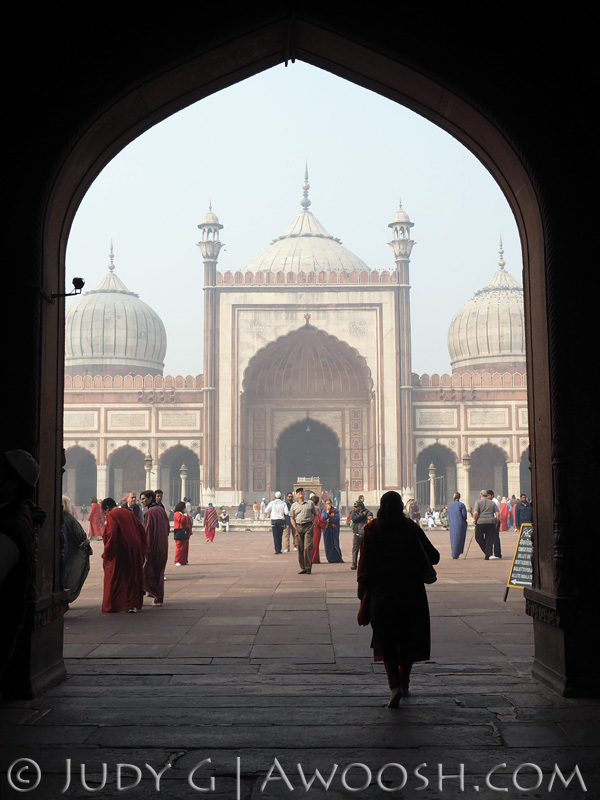 Our first stop in Delhi was Jama Masjid, India’s largest mosque. It is a popular destination for local Muslims and tourists alike, so the tours plan to get there early, before the adjacent narrow streets’ open markets create colossal traffic jams which are pretty much impassable to bigass tour buses like ours. Early morning traffic in the street just outside the mosque. This was before the markets opened. Yikes. At the mosque, we ladies were required to don long flowing robes to modestly cover ourselves neck to toe, and all of us had to wear disposable shoe covers, lest we sully the holy ground with our grubby sandals. We were charged a bit of an usurious ‘camera fee’, which I coughed up, as I really wanted to photograph the girls in their gowns in our first Indian mosque. Costs for these kinds of things were modest in India, but it was our first taste of the continuous requirement to shell out money to people as we traveled. Note to self: bring lots of small US bills, and carry a big wad of Indian rupees in small denominations. We donned the robes, covered our shoes, and climbed the stone steps that led to a large entry gate, which opened into a massive stone courtyard. It was a gorgeous morning, with gauzy, filtered light – the kind that gives photographers raptures. 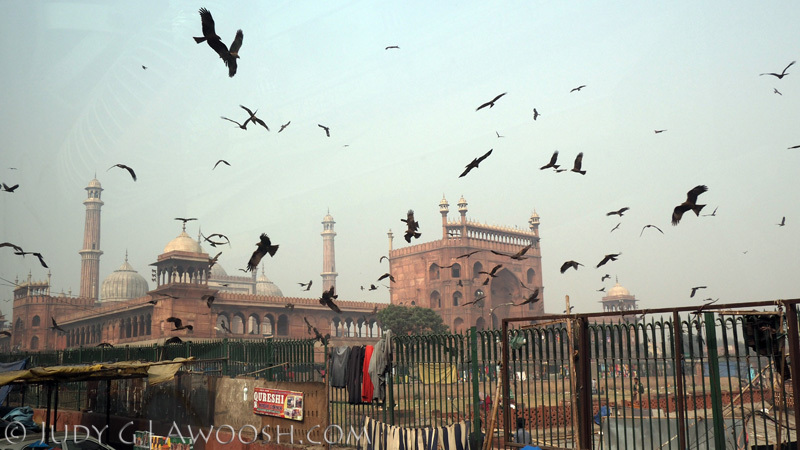 I got busy with the camera right away, but made the mistake of getting too close to the big flock of pigeons that was pecking at food deliberately scattered on the ground for them by a Muslim lady wearing a full on black hijab, for which I was chastised (in Hindi I think). I gave what I hoped was the international gesture of apology, and moved away from dem birds. One of four entries into the mosque compound. Commissioned by Mughal emperor Shah Jahan, and consecrated in 1646, the mosque has been active ever since. If I had done my homework before the trip, I might not have tripped so carelessly across the courtyard. There have been a couple of terrorist attacks in the mosque in the past decade. India has had its share of unrest, and it still simmers. The domes and minarets are majestic – a combination of red sandstone (a popular building material in northern India) and marble. In the courtyard is a large (but not particularly clean-looking) raised pool of water, in which Muslims perform their Wudu ritual – the washing of hands and faces, before they worship. One of the mosque’s beautiful red sandstone and marble minarets. 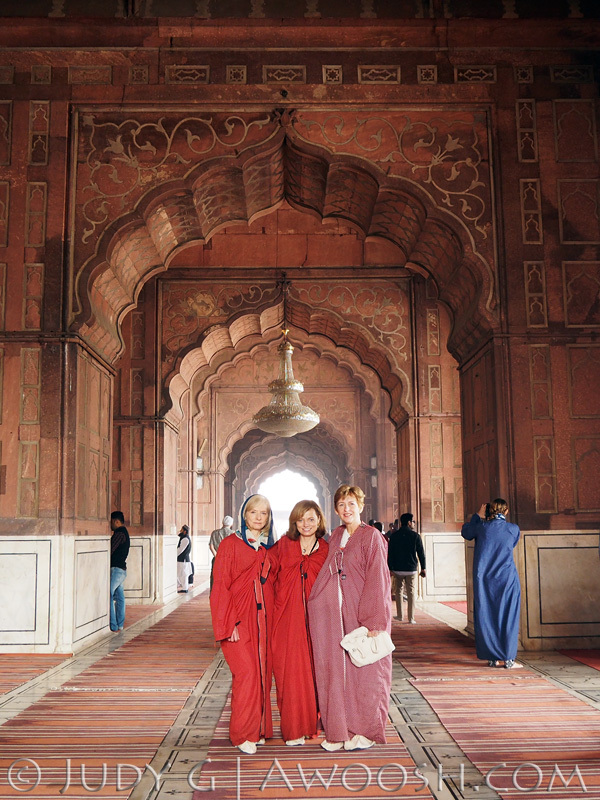 The ladies rocking the robes, in the mosque’s gorgeous carved sandstone interior. 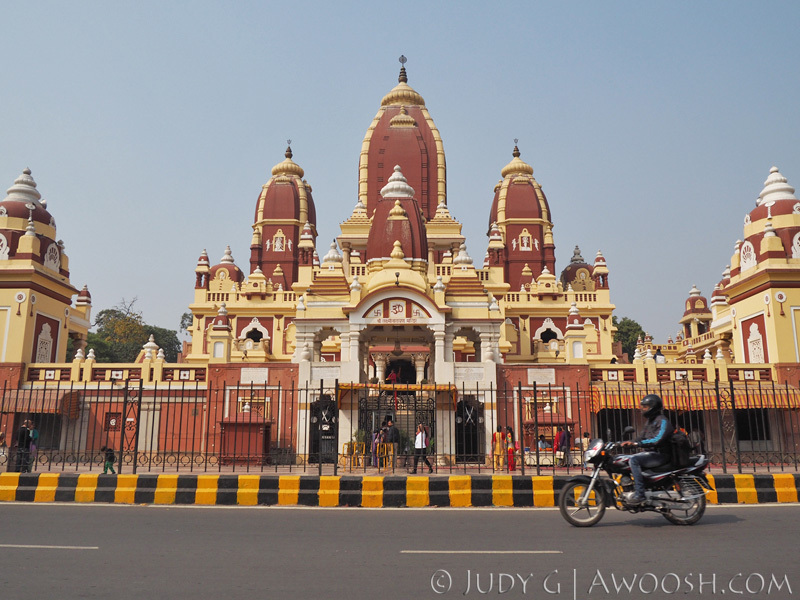 Next up was a stop at the colourful and ornate Laxminarayan Hindu Temple, also known as the Birla Temple of Delhi. Alas, photography is not permitted inside this beautiful place of worship, but I can tell you that it is a peaceful oasis in the centre of the very bustling city of Delhi. Shrines to various Hindu deities are located in different parts of the temple, and devout Hindus perform what is known as puja – a ritual with offerings of flowers, fruit and incense. Chanting monks, unseen but with voices seemingly piped in from heaven, created a peaceful soundtrack. This temple is not particularly old, having been built in the 1930’s, and reportedly inaugurated by Mahatma Gandhi. The Birlas are a very wealthy industrialist family in India, and this was the first major temple that was constructed under their patronage. They have since funded and continue to fund the construction of many more temples in India. The Hindu faith is strong on charity, as Hindus believe that they will be rewarded in their next life for their compassion in this one. 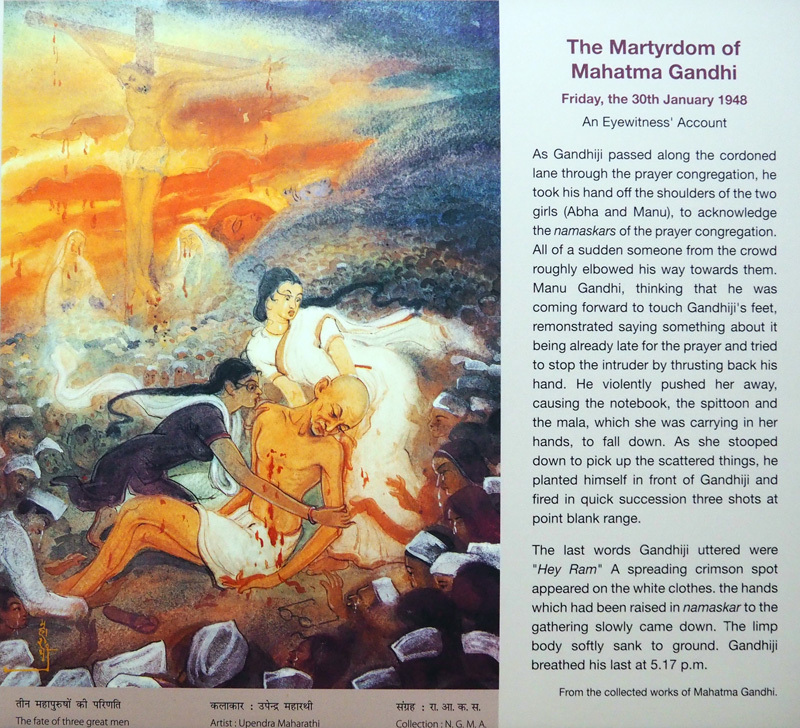 Gandhi looms large in Indian life and lore. There are statues of him in every city, roads named after him, portraits of him hanging in public spaces, parks and buildings dedicated to him – particularly in Delhi, where he lived the last months of his life, and where he was assassinated on January 30, 1948. Gandhi is everywhere. 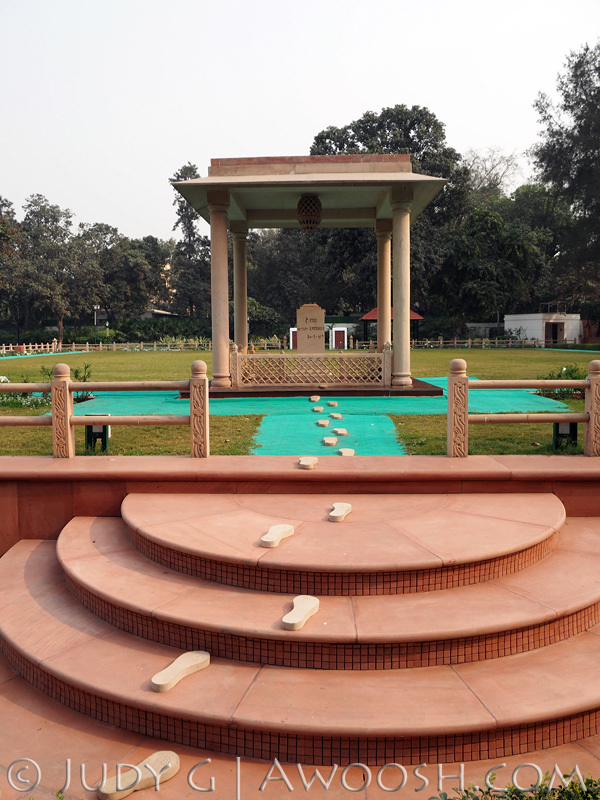 Normally, our tour would have gone to the memorial of Mahatma Gandhi – a large park-like setting, where the ghat (cremation platform) on which Gandhi’s body was burned and his spirit so released to the heavens, is located and stands as a memorial. Unfortunately, when our big white bus pulled up, the venue was not open to the public that day – something or other about visiting dignitaries on the site. 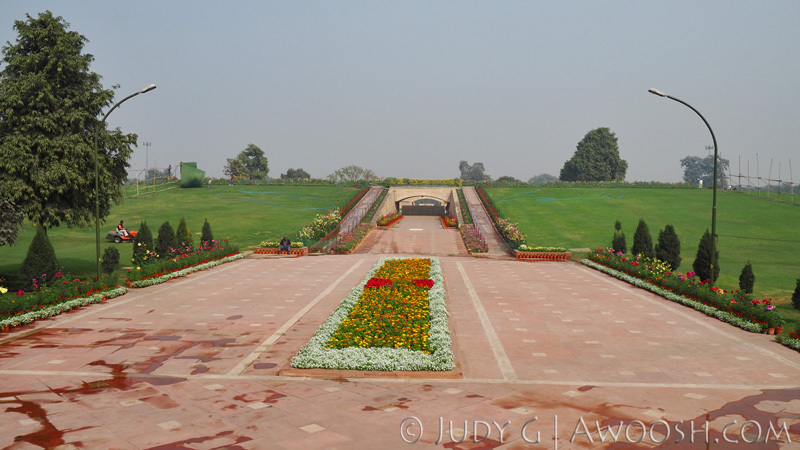 So Bonnie, always at the ready with Plan B, instead led us to Gandhi Simitri – The Martyrdom Site of Mahatma Gandhi, which is the house where Gandhi lived out the last few months of his life, surrounded by a beautiful garden, and where he was killed. It is a beautiful property that was originally owned by the wealthy Burla family I mentioned above, but they since sold it to the government of India to become a Gandhi museum. 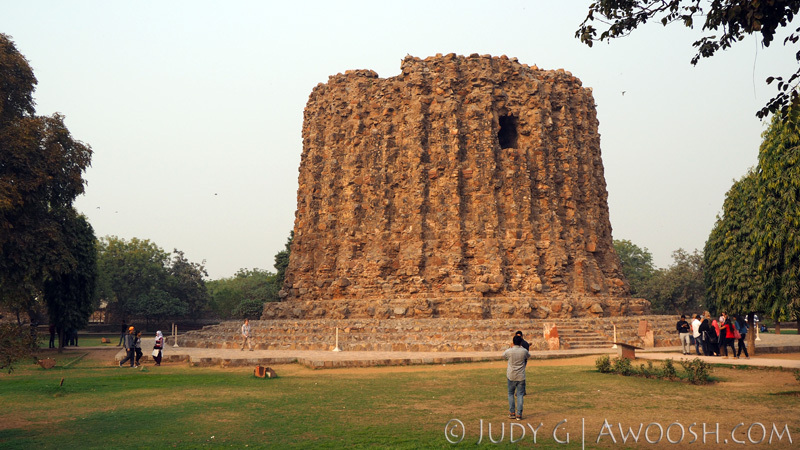 It is another surprising oasis in the craziness of Delhi. You could spend days here, looking at the many photos and words of Gandhi beautifully displayed, and perusing the vast library. After we were disgorged from the bus, we were let loose to roam the museum and property ourselves. Wandering the hallways and reading some of the enlightening words of a man of peace was a serene experience. 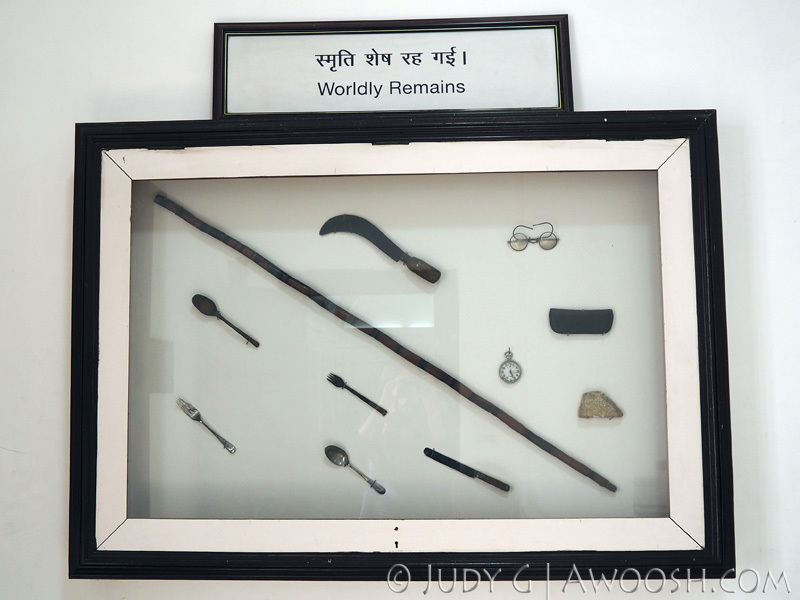 Finding oneself in the small, very modest room that Gandhi occupied during his last months, seeing the framed display of his meagre worldly possessions – clearly a man who walked the talk – was inspiring. And then, out into the garden, following the memorialized footsteps towards his violent death, was emotional. 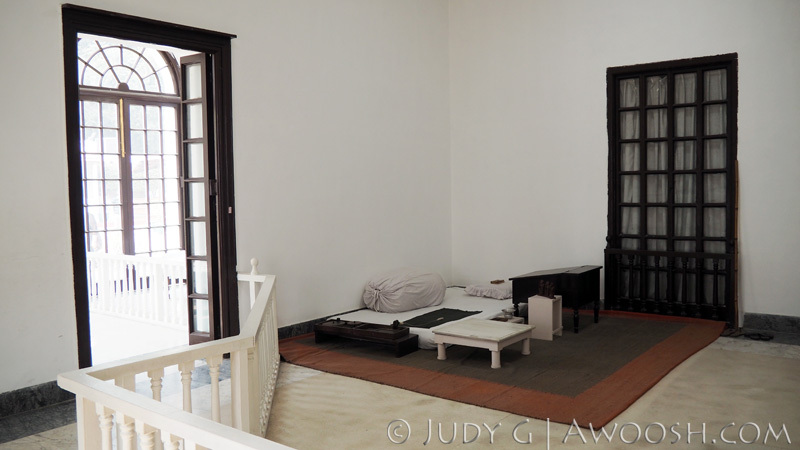 Gandhi’s final residence, where he had meetings, ate, and slept. The door to the left is where he had direct access to the garden path that led him to his death. 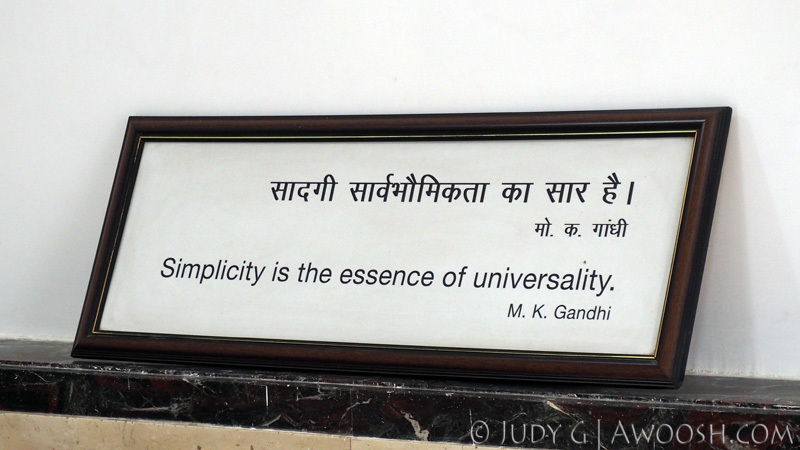 The sum of Gandhi’s stuff. 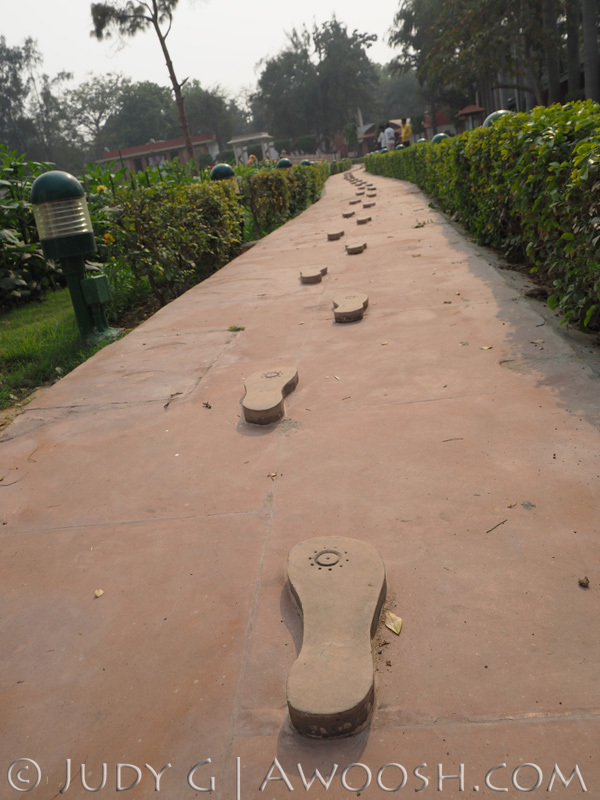 Gandhi’s path to his death. Where he was mortally shot. 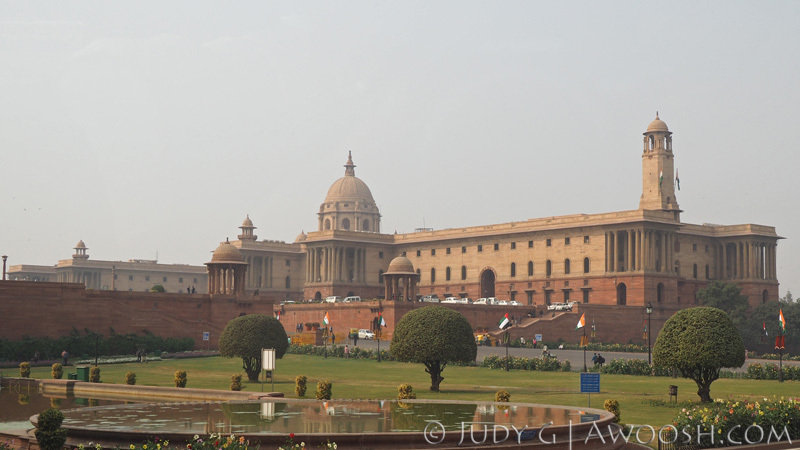 India Gate – A war memorial to Indian soldiers killed in World War 1. 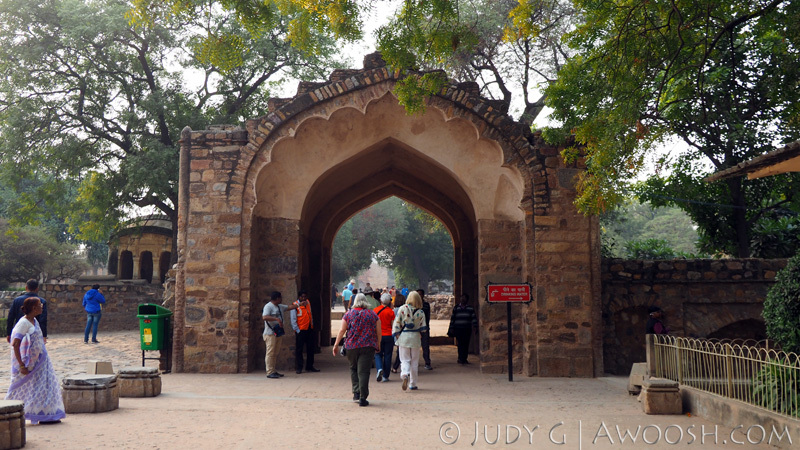 This large archeological site was our last stop of our tour of Delhi before being deposited back at the hotel for the night. 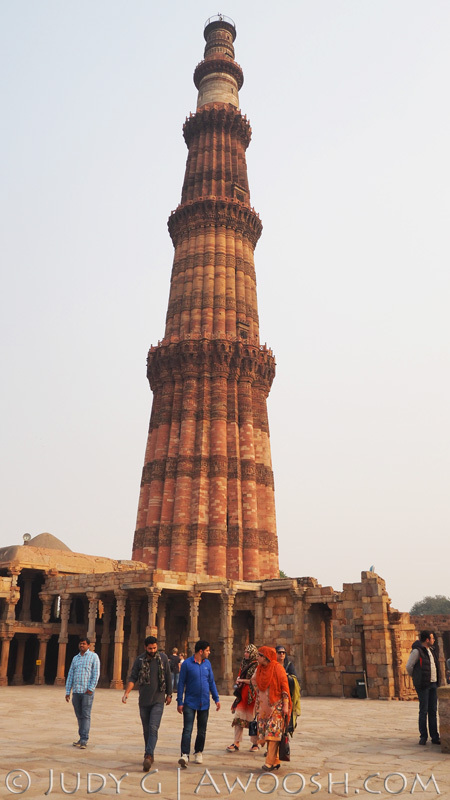 The Kutab Minar is the tallest brick minaret (Islamic tower) in the world. Minarets are the towers from which the Muslim muezzins call the faithful to worship. 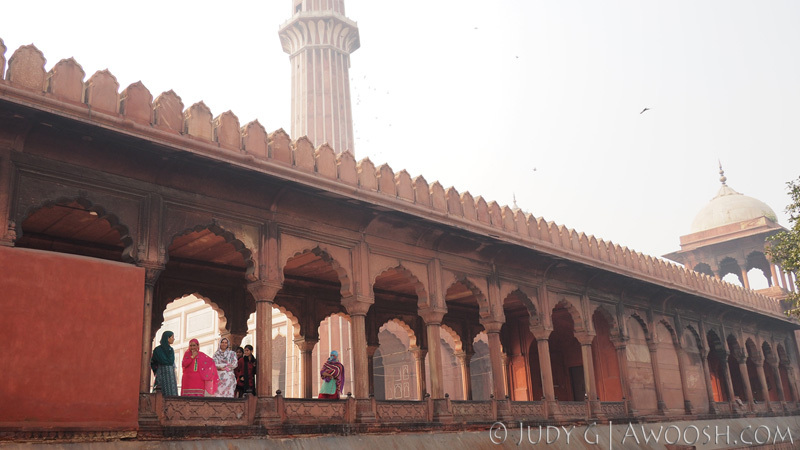 Like the Jama Masjid mosque that we visited earlier in the day, this too is made of red sandstone. 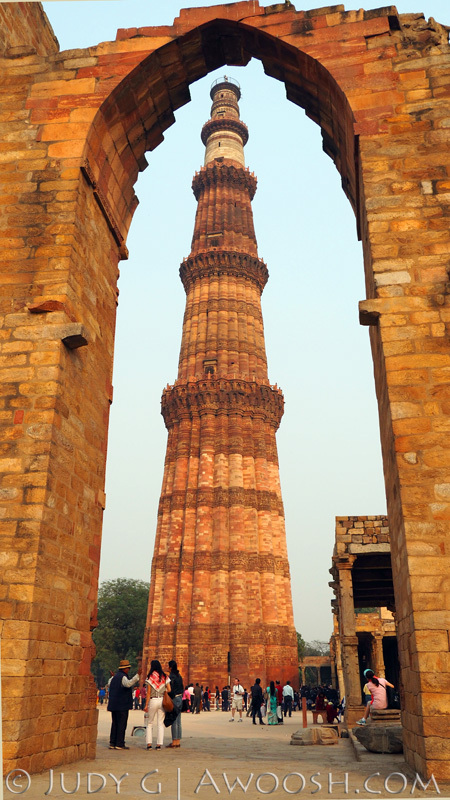 Built in the late 110o’s by the early Muslim invaders of India, it stands at just under 240 feet in height. People used to be able to climb up a stairwell in the interior, but after a terrible catastrophe involving the stampeding to death of school children when the lights accidentally went out, the public is no longer permitted to climb the minaret to enjoy the views offered from on high. 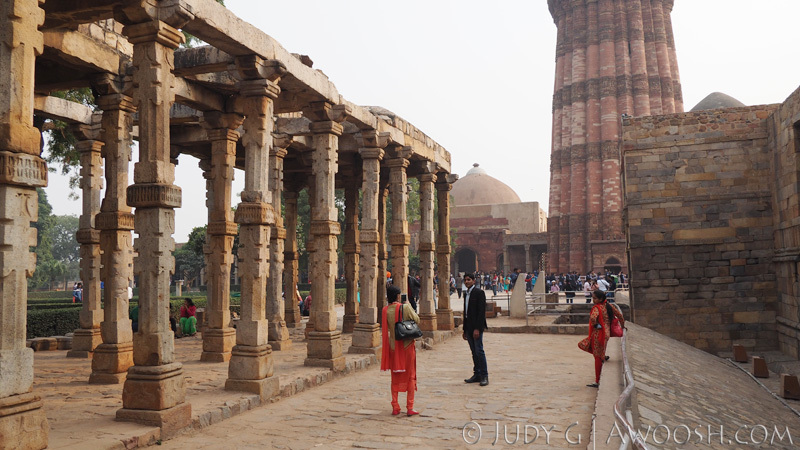 I have to admit by the time we got to this site I was somewhat super-saturated with Delhi details. Instead of following the guide and listening carefully to the description of the various structures on this large complex, I wandered off with the camera to try to capture some of the scenes. The entry arch to this World Heritage Site. Past this row of ancient columns. you can just make out the mosque to the left of the minaret. 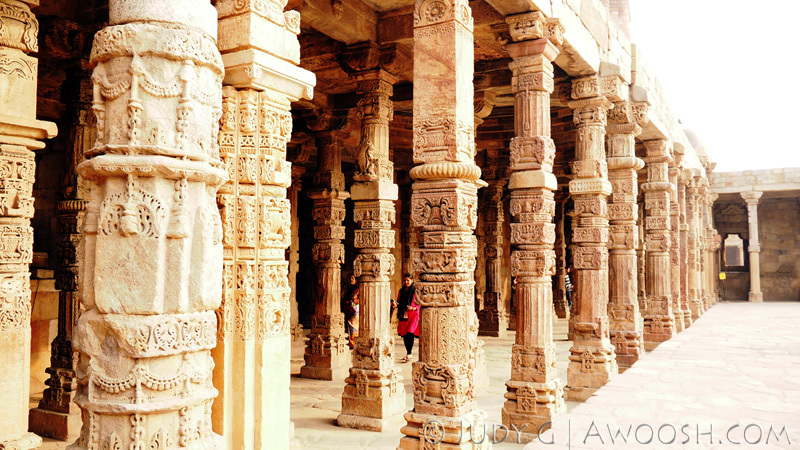 Ancient carved columns. The site has many structures, from many different historical periods. 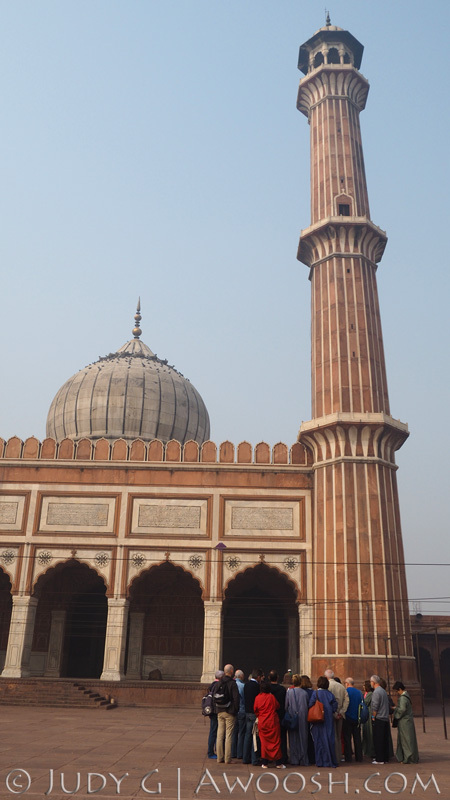 The mosque and minaret were built over top of ancient Indian structures. Whew! Well that was a day. Just think – you are probably a bit fatigued after reading this thing and wading through the pictures. I can assure you that we were tired, hungry, and very ready for an ice cold Kingfisher lager by the time we climbed down off the bus at the hotel very late in the afternoon. As for tomorrow? 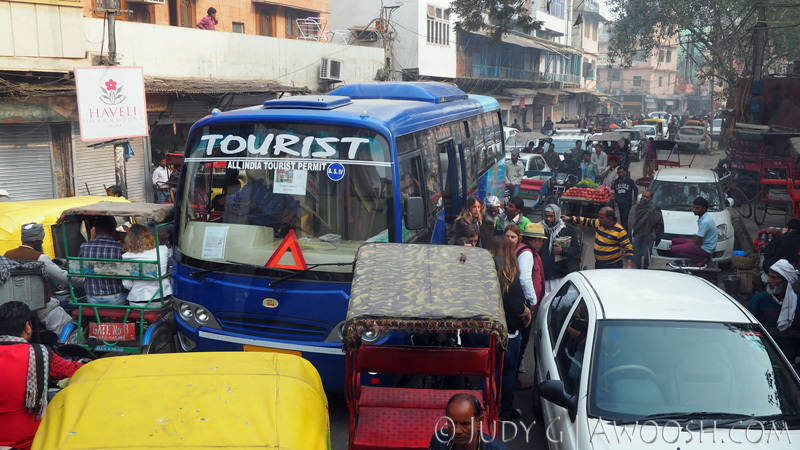 It’s a travel day on the bus – leaving Delhi and heading for Jaipur – the pink city. And it is a loooooong drive. We’ll be seeing camels, and monkeys, and cows, and dogs, and goats, and lots and lots of Indian scenery. This entry was posted in Photography, Travel, Trip Reports and tagged Birla Temple, Delhi, Gandhi Museum, Gandhi Simitri, India, Jama Masjid, Kutab Minar, Qutb, SmarTours. Bookmark the permalink.